"South part of Main Street, Chepachet, R. I." by Edgar S. Potter, Chepachet, R.I.
South part of Main Street, Chepachet, R. I.
Edgar S. Potter, Chepachet, R.I.
Used. Postmark: April 22 (no year). 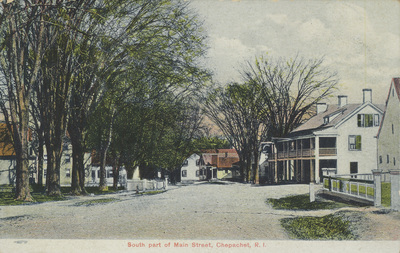 Edgar S. Potter, Chepachet, R.I., "South part of Main Street, Chepachet, R. I." (1915). Rhode Island Postcards. 260.